The second of our ancient numbering systems, Norse Runes, predates the Japanese use of Kanji but their use has long since been abandoned. Runes were in active use from right around 150 AD to 1100 AD and span three different but related alphabets: Elder Futhark (around 150–800 AD), the Anglo-Saxon Futhorc (400–1100 AD), and the Younger Futhark (800–1100 AD). The Vikings sometimes used the Runic alphabet as shorthand numbers. Though typically numbers were spelled out. Researchers have found instances where the first letter of the number’s name is used as a place holder for the number. The means that the symbol ᚠ or feoh could mean wealth or the ordinal number one (first in the English language). Using this system of shorthand numbers, we get these symbols standing in for their Viking numbers. Many thanks to the Viking Answer Lady for posing a list of ordinal numbers in Old Norse. 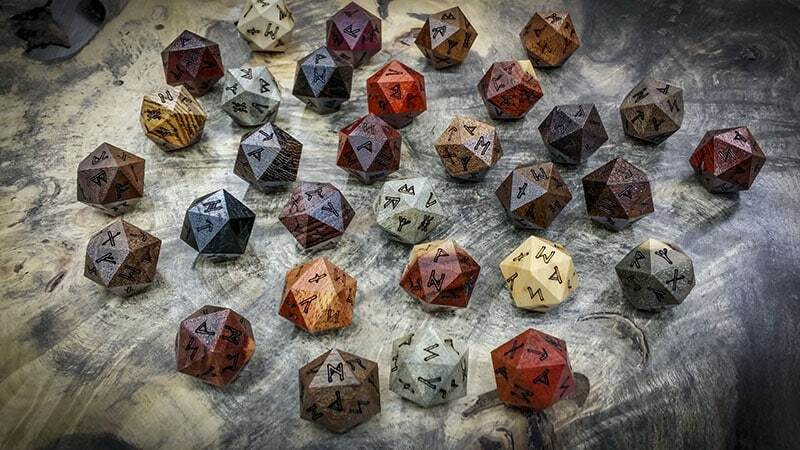 These are made from assorted exotic woods, and the specific wood for your die will be chosen at random. You may also choose to have your die crafted in Black Soapstone as well. I got this dice in and it was bad arse! The runes look amazing and my group is eager to use it in in-game gambling D&D. Thank you guys for the amazing die! Amazing detailed runes, and the edges of faces are very sharp so the checks will be properly random. But I guess the varnish was applied with spray so the touch is too grainy, far from wooden organic touch.